drinkboston.com » Blog Archive » Vodka – now with flavor! I haven’t tasted it yet, but I’m getting the same vibe as I did regarding Bols and Leblon. By that I mean even my father did an informal vodka tasting years ago and found potato based versions had more interesting flavors than those made with wheat and “triple” or whatnot distilled. And there are a lot of potato-based vodkas around that are not in the super premium price range. My comparison to Bols and Leblon is that both were heralded locally as the introduction of interesting new spirits into the marketplace, while in fact there were already examples of both genever and cachaca available in local liquor stores that were never marketed to establishments that cared about their cocktail offerings. I’ll be interested to taste Karlsson Gold (which is priced in the premium category) next to other potato vodkas from Eastern Europe that are available well under $30. “We don’t have that” I retort. “Well, which vodka would you recommend?” he asks. “If you hate vodka, why would you recommend that?” he asks. “Because it’s not vodka” I say. He had 3 Karlsson’s on the rocks that night and thanked me at the end. True – “potato eau de vie” is a better name, strictly speaking any alcohol made with potatoes should not be called “vodka”. “Real” vodka is grain alcohol plus water. So Laurie I don’t think you’ve found a “better vodka” just a new way to enjoy alcohol. Please let us know of the results of your experiment, Arnold. A big part of the thing with Karlsson’s is the unique quality of the potatoes. Apparently, according to someone who has sampled them, it’s not too far off to compare them to wine grapes, complete with characteristics differing from year to year and field to field. Aaron, thanks for sharing that uplifting tale of conversion. Jon — really? I thought vodka could be made out of any plant matter as long as it’s rendered colorless, odorless and flavorless in the distillation process. Then again, I did hear of some kerfuffle in the EU where Ciroc was being banned from calling itself vodka ’cause it’s made from grapes. Anyhoo, next time you go to Russia, take me with you. I want in on the black bread and dried fish. I think Jon in NH might be offering a purist’s description, but I think from a USDA perspective, it can be based on ethanol derived from just about any plant base as long as it is flavorless and doesn’t overlap with another established, narrowly-defined category. For example, I think that at some point soon, Ciroc will be prevented from calling its product vodka because it’s grape-based and thus falls into the brandy category. Regardless, I can’t imagine how there’s much differentiation in flavor when most US producer buy corn ethanol in bulk from Archer Daniels Midland and then dilute it for bottling. Given that retailers & restauranteurs are more inclined to latch onto a “hot” vodka than a similar new gin or rye or tequila, there’s a chance that Karllson’s might gain some traction in the market. From what you’ve written, I hope so. I’d love to see this brand penetrate more genres of watering holes than just craft bars. I agree with Aaron, I don’t recommend either of the 2 vodkas we carry at my bar. However, we offer around 7 different kinds of Gin, all with different flavor profiles. But, to each his own. I enjoy a dirty vodka martini every now and again…course, i might as well drink olive juice and water. But it doesn’t quite get the job done. I work at a wine, cheese, and chocalate bar out here in Worcester. Woman sits at the bar and asks if we have ranch dressing and american cheese…as opposed to artisenal cheeses and housemade dressings that are on our menu, and she scoffed at it…needless to say, it was a tough night. At that point, I reach for a shot of the Fernet and ginger beer…I feel that a big part of the job in being a bartender is that of an educator. Cheers! 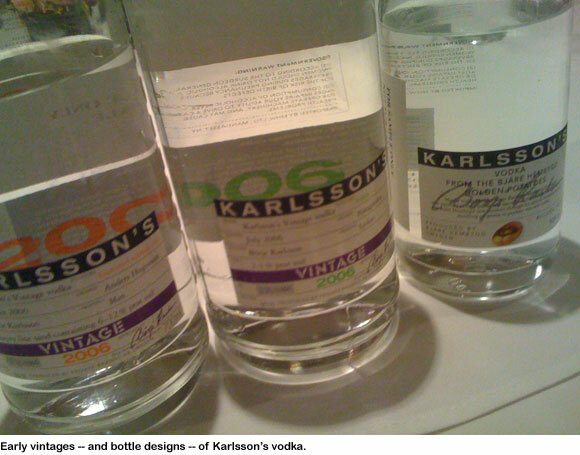 I am the brand manager for Karlsson’s Gold Vodka in southern California. Your link was sent to me by our public relations firm. I must say I too was not a vodka fan, still not. But i do love Karlsson’s. I really enjoyed your comments and the way it was writen. If ever any of you Bostonians come to San Diego and want to know where to have a Karlsson’s on a hot summer day, let me know. Thanks for your support. A spirit to go with dried fish and bread? Akavit, anyone?